Books | Fulcrum ConsultingWorks Inc. Most manufacturers are good enough at many aspects of their business, but surprisingly few are excellent at what matters most. In fact, all manufacturers can still do better at their most critical competencies. How can your company improve and grow? 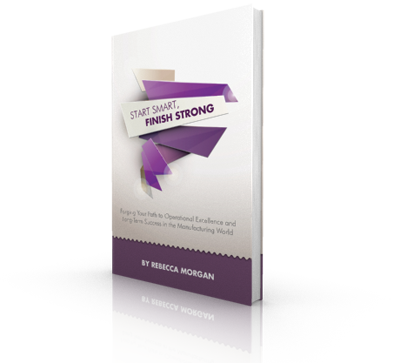 Start Smart, Finish Strong helps you answer that question—and then gives you practical ways to achieve true transformation at your company. For over 25 years, Rebecca Morgan has helped manufacturers leverage their resources to be more successful. Along the way, she has discovered the behaviors, capabilities, and best practices that drive excellence in manufacturing. In this landmark book, Morgan shares 58 powerful strategies to help any manufacturer dramatically improve. Follow Morgan’s expert advice—on everything from effective leadership to supply chain management to data and technology—and you’ll forge your own path to operational excellence and long-term success.